Make the chutney by blitzing the ingredients together in a small blender. Taste and adjust the seasoning. Boil the potatoes until soft (about 10 minutes). Drain and cool. At the same time, simmer the lentils and chana dhal for 20 minutes with the turmeric. Mash with a wooden spoon and thicken a little on medium heat. Stir in the chillies and garam masala. Mix in the potatoes and mash everything well together. Shape into balls. Mix the chickpea flour and water together to make a light batter. 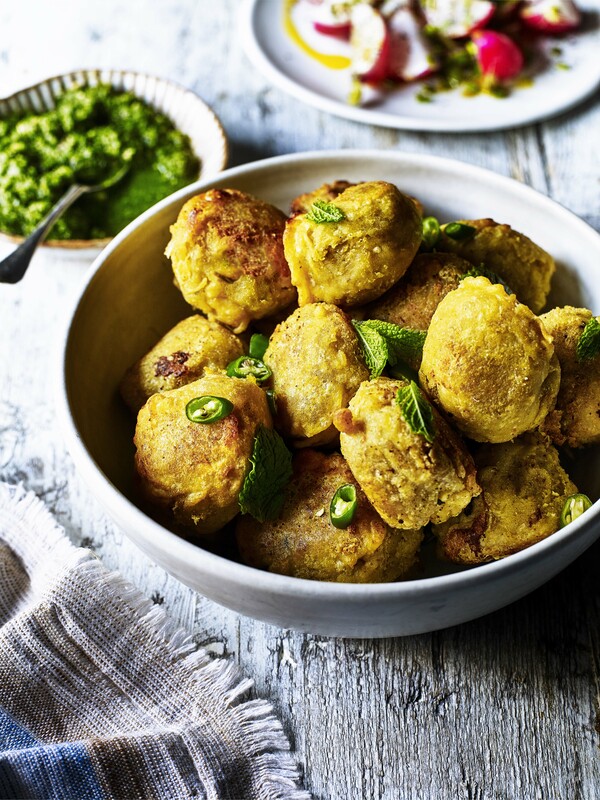 Heat an inch or two of rapeseed oil in a deep pan and dip the balls in the batter then fry them in batches until crisp and golden. Serve warm with the chutney and some coriander leaves and chillies.